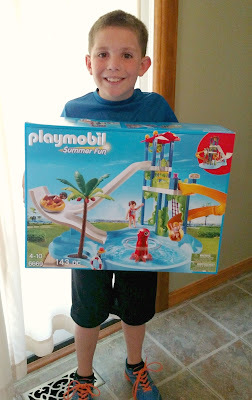 Summer is heating up and there's no better way to have fun in the sun than with PLAYMOBIL's NEW Water Park with Slides playset, a colorful, creative, high quality playset for lots of imaginative play! Great for outdoor use, this playset includes two jumbo slides for the figures to slip and slide their way down to the wave pool! Take a break from the summer heat with a visit to the Water Park with Slides. With two jumbo slides, one regular and one for tubing, kids can slip and slide their way down to the wave pool at the bottom. The octopus in the middle spins, creating fun ripples throughout the pool. When ready to take a ride down the slide, use the park’s pulley to pull the tube up to the top of the slide. Just be sure to wait until the pink octopus gives you a green smile for heading down the slide. My son is 8, and very much into building and putting things together. He was adamant that he wanted to put this set together himself as it was only 143 pieces, my husband and I supervised the entire time. A few times we had to step in to get the item to click together. The instructions were easy to follow and it did not take him long to get the set put together. It was great the certain pieces were bagged together, it made it easier! All summer we hit the real water park, so it is fun to see this toy replica of one. They have thought of everything! The floating tube can be hoisted to the upper level using the tower pulley. If you rotate the red octopus to create fun ripples in the pool, just like a small wave pool. 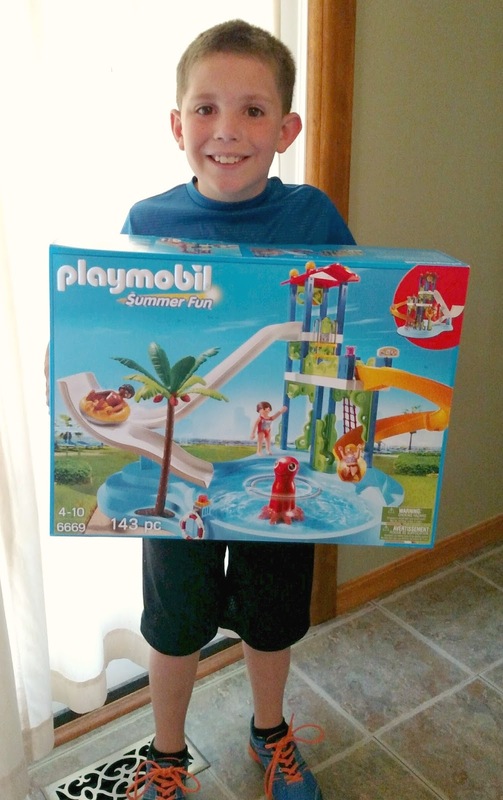 Now kids can splash around outside with their favorite PLAYMOBIL characters and let them cool off this summer as well! PLAYMOBIL, one of the top toy manufacturers in the world, remains at the forefront of creative play. This a really well made toy that truly does encourages thoughtful and creative play. Children can play with this set on its own, or combine with Water Park Play Area or any other PLAYMOBIL sets for hours of fun. 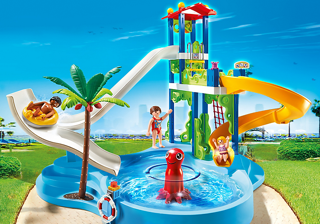 Set includes two adult figure, one child figure, multi-level structure with slides, tube, life ring, and lots of other accessories. Dimensions: 21.7 x 15.7 x 15.7 in (LxWxH). Purchase on Amazon for $59.99 + free shipping!